These are bored pile constructed with small gaps between adjacent piles, Large spacing is avoided as it can result in caving of soil through gap. Generally used to form a retaining wall or for the construction of deep basement. The gap between the piles is grouted to form a water tight structure. These type of piles are used for stiff and cohesive sub soil. The pile is formed by initial drilling into the ground, cement-sand grout or concrete is then injected under pressure. Thereafter, a reinforcement cage is placed into the fluid column of grout or concrete. 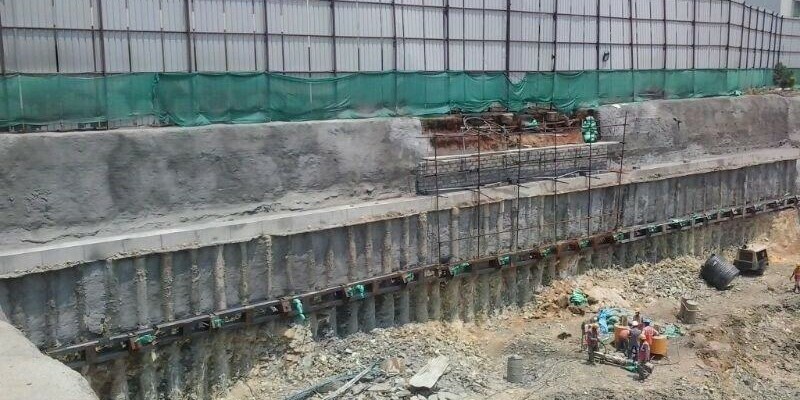 The contiguous pile wall can be used where ground water is not a hazard or where grouting or jet grouting can be used to control leakage between the piles.